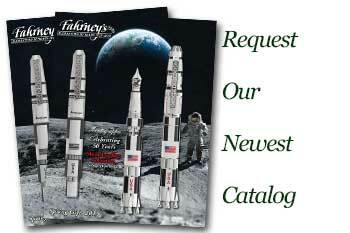 Order your Taccia Timeless Hexagon Ballpoint Pen today from FahrneysPens.com. Fine Pens, Refills & Luxurious Gifts – great prices & fast shipping. Precision-forged metal body is inlaid with woodgrain accents and fitted with a wide, spring loaded clip, the Taccia Timeless Hexagon Ballpoint Pen perfectly mixes elements of old-world charm with high-tech flair. The popular ball pen is fitted with a smooth German-made twist-action mechanism. Choose from sleek brushed metal finishes in gunmetal or the new black. Each pen comes with a matching leather zip pen case. The Taccia Timeless Hexagon ballpoint is an outstanding pen! I think that giving it as a gift one would need to recognize that it is a hefty pen, and the hexagonal shape may not be comfortable to some writers. However, it's unique finish and exceptional writing quality make this a nice gift for any pen afficionado. I think that I would like this pen much better if the edges of the metal weren't so sharp as to make the pen very uncomfortable to use for long periods of time. I also would like to see the click top actuation mode. The looks, feel, and heft of the pen are excellent.